Maui Hiking Tours are a great way to see Maui, Hawaii. By booking your Maui Hiking Tour with Maui Tours, you can save big on your vacation! Find the best Maui Hiking Tours on Maui at Maui Tours. We offer the best Hiking on Maui through our Maui Hiking Tour Operators. You can visit the West Maui Mountains, Rainforests, beaches, and more! 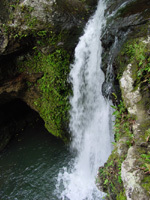 Maui hiking tours are a great way to experience the Maui rainforest, waterfalls, or beautiful tropical jungle. The most spectacular hikes on Maui are through Haleakala Crater's 30 miles of trail. You can try 10-mile long Halemauu Trail, descending 1400 feet to the crater floor, or 10-mile Sliding Sands Trail which begins from the visitors center and ends at Paliku Cabin. Kaupo Gap Trail begins at Paliku Cabin and descends rapidly through the semi-ghost town of Kaupo. 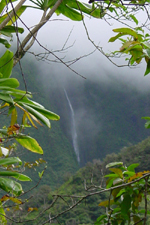 We offer the best Maui Hiking Tours that you'll find on the web. We use only the most reputable and professional guides, and we offer big savings over other booking agencies. You can hike Hana, rainforests, waterfalls, Haleakala, or the West Maui mountains! What of the Maui Hiking Tours are you interested in? Hike into an enchanting valley and follow one of the most magnificent streams on Maui to a network of pools and cascading Maui waterfalls! Choose from 3-hour, half, or full day adventures. Do you want to see the best of the West Maui Mountains? Enjoy beautiful Honolua Bay, Nakalele Blowhole, and Kahakuloa Village. Take a swim in two different Maui waterfalls, snap some pictures, and be back by noon. 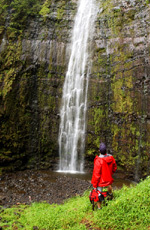 Experience the West Maui Mountains, with a storybook rainforest hike to a magnificent shimmering waterfall. Imagine walking along a trail covered with a green jungle canopy, and strolling along a streambed to a beautiful waterfall pool. Meander through Taro fields that were once famed by ancient Hawaiians. You will see mystical Maui waterfalls, cascading down lush canyon walls, exotic fruit trees, and experience the real history of Hawaii. If you want an adventure to write home about, this is it. Enjoy Hana, the most tropical destination on Maui.